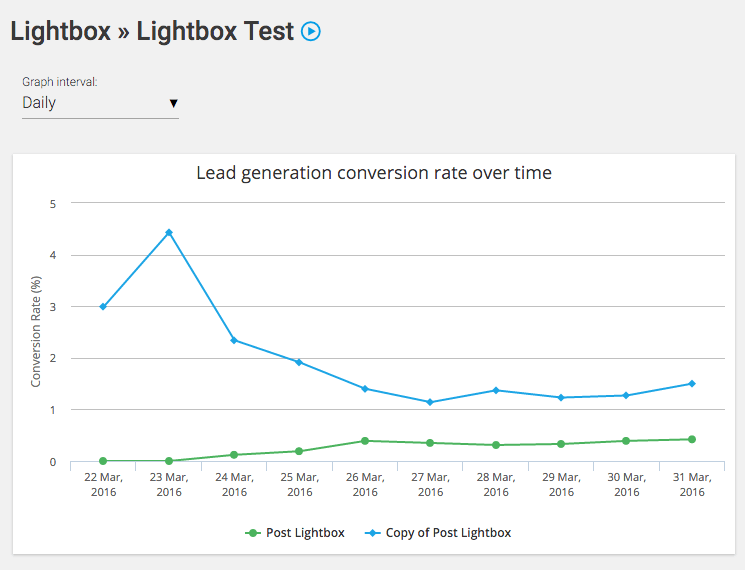 In this post, you’ll discover how easy it is to do simple A/B split testing for your email opt-in pop-up forms using the powerful Thrive Leads plugin for WordPress. I once believed that if I created an irresistible enough offer, and I combined this offer with a compelling enough opt-in box, it would be merely enough to get people subscribing to my email newsletter. Believe it or not for a while that tactic actually worked. That was until I realized the benefits of doing A/B testing. You see I always thought that if it worked then great, and if it didn’t work then I’d just have to start over and create another offer or design another email form. But seriously, how much valuable time and resources would that take up? A lot is the answer to that question. Doing simple A/B split testing would save me a ton of time, and if I could get the results I wanted then even better, right? 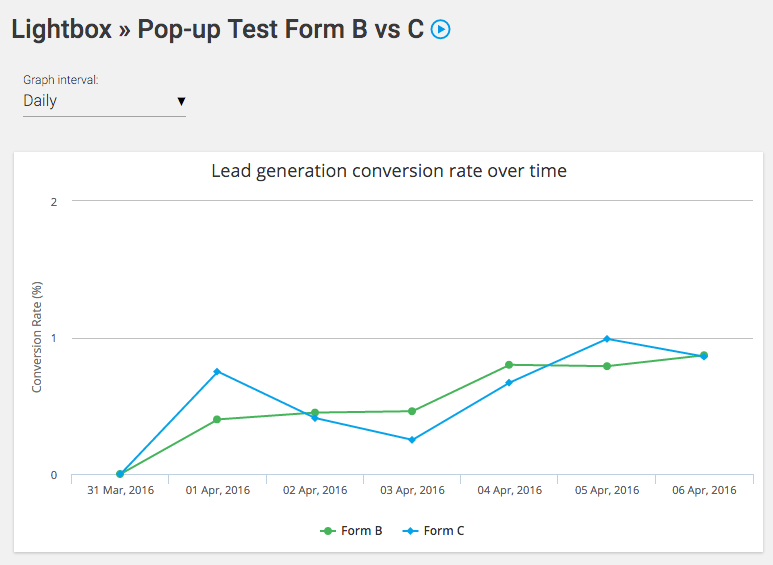 Well, in this post I’m going to share with you the results I got from doing a very simple A/B test for my email pop-up opt-in form. Let me kick off by talking to you a little bit about my amazing offer, moreover, one of the incentives that I use to help me build my beautiful email list. Since creating and launching this little guide about two years ago, it has been downloaded over 1,000 times. Over the course of this time, the guide has obviously increased in size with newly added content etc. Initially, it was only about 15 pages long when I launched it. It’s now over 40 pages long. 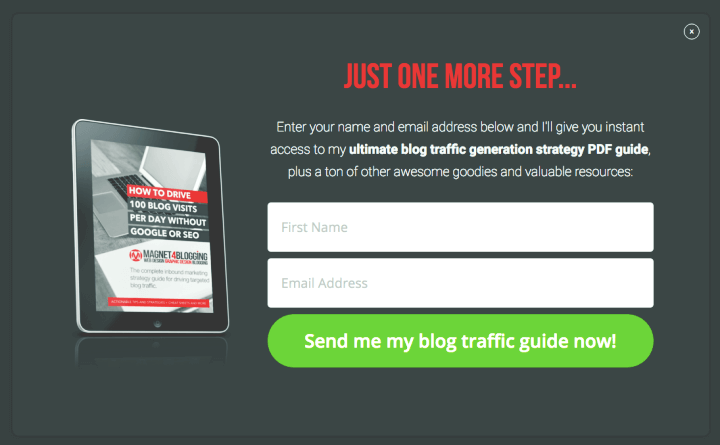 OK so as the title of this guide suggests, it’s a traffic generation guide for bloggers. I won’t dive too deep into the content of this guide, however, I will say that it’s packed with a lot of awesome value. There’s some great practical and actionable tips and ideas for increasing blog traffic without doing SEO work. Most of the tips and ideas in this little guide I’ve tried and tested myself, and I’ve gotten some great results too. Takeaway point: Get your thinking cap on and create an irresistible incentive for your blog. Something that will really help your readers out, and something that’s 100% aligned with your business goals, values, etc. A 2-step lightbox pop-up opt-in form. Yes I know it’s a bit of a mouthful, right? So what I did was create several versions of this custom light box using the awesome list building and opt-in form builder plugin for WordPress, Thrive Leads. I’m sure you’ve heard me talk about this amazing plugin so many times here. No better tool for the job in my opinion. Anyway, I created both forms identically (Form A and Form B), with some slight variations between the two versions. Here’s a snap shot of the opt-in form A, in the first step and second step. I’ve tried to keep the form design and branding the same as my website, i.e. colors and layout. Now here’s a snap shot of the pop-up form B, in the first and second steps. Can you spot the variations? Well, in the first step of Form B all I did was add a more specific headline title. Instead of just asking visitors “do you want to know how to drive more traffic…”, I used numbers to specify just how much more traffic. i.e. 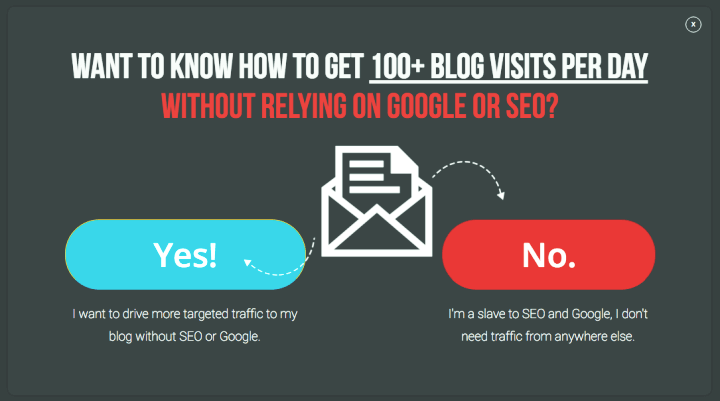 “100+ Blog Visits Per Day”. I also made some slight variations in the Yes and No submit buttons too. In the second step of Form B, I used a different call-to-action inside the button. 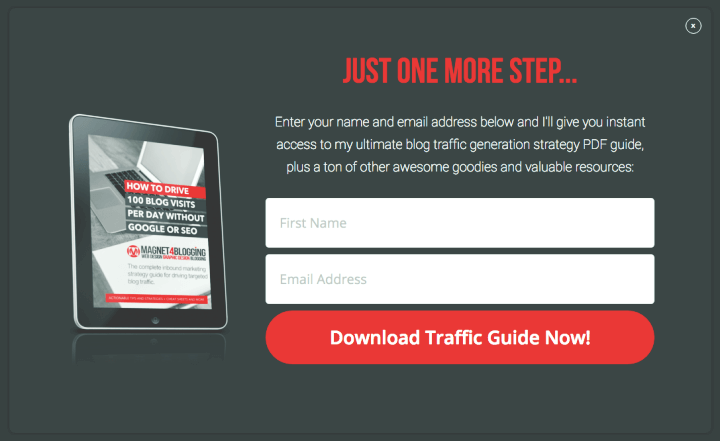 Instead of just using “download the traffic guide now”, I placed a more direct command like “send me my blog traffic guide now”. There are no differences in design or layout for both forms A and B.
I should also mention that both forms trigger to launch after 40 seconds on page load. So that means if a visitor stays on my site for more than 40 seconds, shortly after that time they’ll see my pop-up form. Both forms are set to trigger on exit too and loads once every other day. Trigger on exit means, if a user moves their cursor out of the window frame, i.e. to close the tab or click the back button, the form will automatically trigger and pop up. Form A uses a ‘slide in from the top’ animation, whilst Form B uses a ‘rotational’ animation. So how much of an impact have these slight variations made on my opt-in conversions? How have these forms performed against each other? Oh, before I forget to mention this, I tested these forms against each other over the course of 9 whole days. If you look at the graph below you’ll see that Form A, which is the green line, did not convert very well at all when compared to Form B, which is the blue line. Form A, in fact, struggled from day one resulting in a lousy 0.68% conversion rate. Form B, on the other hand, did a little better resulting in a conversion rate of 1.49%. Not great by far, but still a decent result. Form B had a 97.85% chance of beating the original form (Form A). So it would have probably made sense for me to just end the test there and then and go on with Form B, right? Since the conversion rate is slightly higher than Form A. The thing is I wanted to do some more experimenting, so I created a third pop-up form (Form C) and tested it against Form B.
Here’s a snap shot of Form C.
As you’ll immediately notice, I changed the headline title slightly to make it shorter and more click-worthy, and I also changed the button color of the “Yes” and “Submit” button to green. The animation I selected for form C was ‘slide from the top’, same as form A from the first test. The result of Form C? So here are the results of the test for form B against the new form C for the duration of the 7 whole days. This time not much difference between the two forms as far as conversions go. 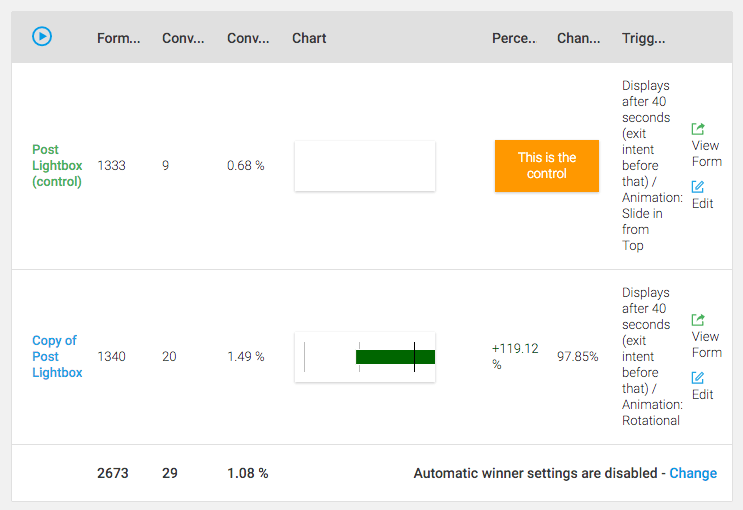 Form C only had a 29.21% chance of beating form B, but 0.84% conversions aren’t far off 1.08%, right? I made the decision to end the test there and award form B as the overall winner, but, I would have probably gotten a more insightful result had I allowed the test to run for a longer duration I think. Still, I can always head back to the design board and create some new forms to put up against form B, later on, should I wish. Again, I just wanted to show you how I did a simple A/B test on just my email pop-up form. I am also testing other forms as well, such as the sidebar form and ribbon form above the header of my blog, and I’m getting some interesting results. 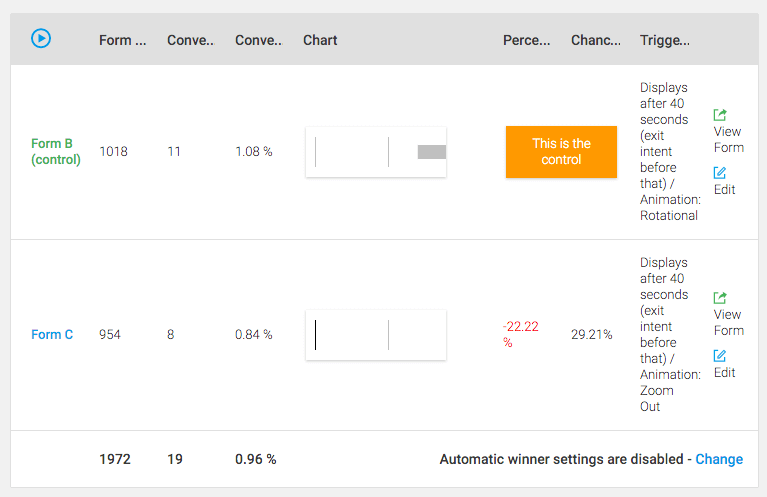 I’m sharing with you the result of this simple test to show you that doing A/B split testing for your opt-in forms doesn’t have to be a costly, time-consuming challenge. Again, the tool that I’m using to do these simple tests with is called Thrive Leads by Thrive Themes. Thrive Leads is a powerful opt-in form builder plugin with a host of built-in conversion optimization features and options. You can check out my review of Thrive Leads email opt-in form builder here. So are you ready to split test your forms? Are you currently building your email list using various opt-in forms on your blog or WordPress website? If so, are you doing split testing too? Which forms are working best for you right now? Are you using an incentive offer?